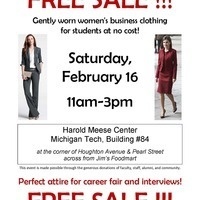 Gently worn women's business clothing for students at no cost! Perfect attire for career fair and interviews! This event is made possible through the generous donations of faculty, staff, alumni, and community.